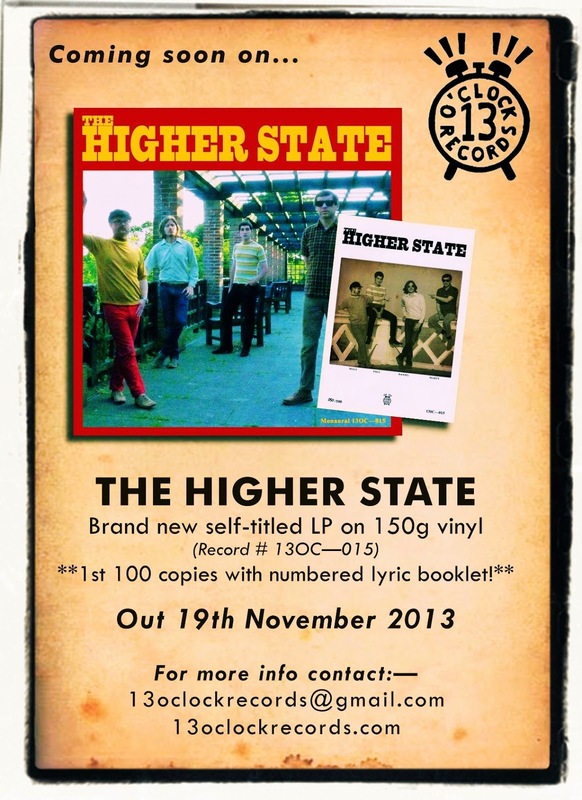 This was England's very own The Higher State's fourth album and third for Austin, Texas label, 13 O'Clock Records. I'm uncertain as to any reason why the group decided not to give the album a title, maybe they just didn't want to, after all the band name alone is so killer, why detract from a Higher State? Out of interest 13 O'Clock Records are a new label who've been busy recruiting talented groups and performers from around the globe, mostly European I may add. Their roster also includes Paul Messis, who is the new bass player for The Higher State, The Flight Reaction (from Sweden), Os Haxixins (from Brazil) and Arsene Obscene (from France). They also reproduce wonderful thick card album sleeves and use heavy vinyl. Satisfaction is guaranteed for the purveyor of a quality record. If this wasn't enough, The Higher State have recorded their new long player in MONO and it all sounds sublime. The album was officially released on the 12th November 2013 but I got a sneak preview of it's folk-rockin' greatness via a very limited edition promo CD that Higher State's drummer Mole kindly sent me during October. It's taken me nine months to get my act together and write a review! In hindsight, the year 2013 was quite busy for The Higher State. They replaced bass player Ben Jones with Paul Messis. I have exchanged many emails with Paul over the years and I can say for certain that he was thrilled to be joining such an amazing group, after all, The Higher State are the U.K's foremost exponents of authentic folk-rock. Who wouldn't want to be associated with and part of such a class act? With this album, Kent's finest have gone all out to create a purist '65/'66 Los Angeles / Sunset Strip folk rock masterpiece. 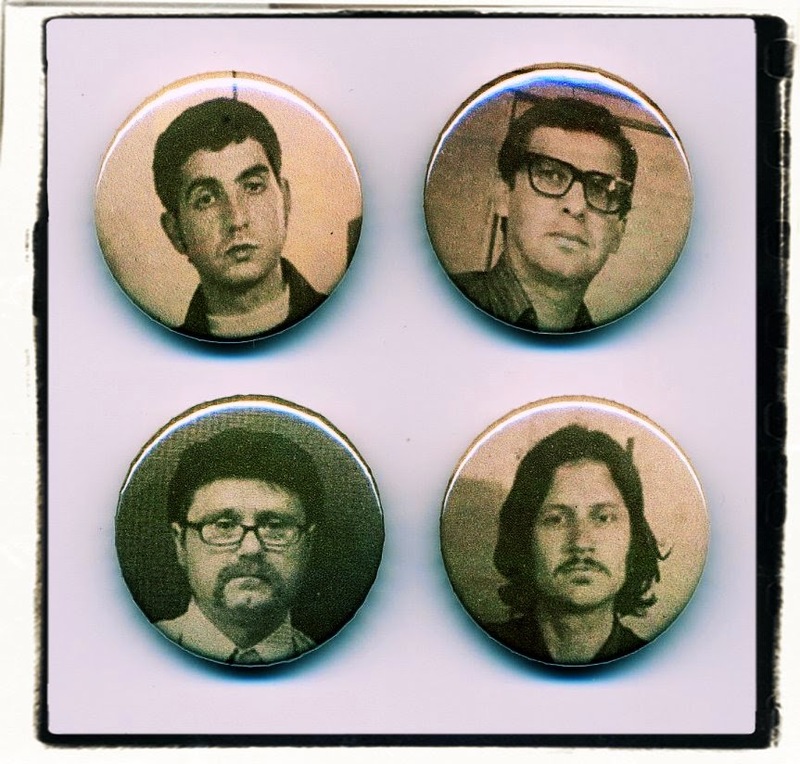 It's a direction that they've hinted at ever since they began recording but in 2013 it seems that The Higher State focused their efforts wholly on this style of music. The music is expertly recorded by Marty & Mole at Sandgate Sound Studio where they have custom built an 8 track recording facility. All twelve songs have beautiful multi-layered harmonies over the soundscapes of Rickenbacker jangle, tambourine splashes and drum patterns that are at the very least the equal of anything laid down at the 'epicentre of jangle' during mid 1965 to mid 1966. Paul Messis provided one song in the set, the driving folk rocker 'Why Don't You Prove It' which adds clattering Keith Moon style stick work and stellar guitar tones. Marty's opening gambits 'Need To Shine' and 'Jagged Words' are sublime and so too is his mournful 'Sky Clears To Blue' which sounds like the same kind of 12 string moody trip Westchester, LA combo The Roosters were so adept at recording. Side two opens with the exciting single 'Potentially (Everyone Is Your Enemy)' and continues on an unrelenting folk jangling trip until the powerful 'Try Slowing Down' where Marty spits out some insightful and thought provoking words seemingly about 'plastic people'. Where will it end - where will it end. It helps to divert from your fears. as the band wagon rolls along - rolls along." 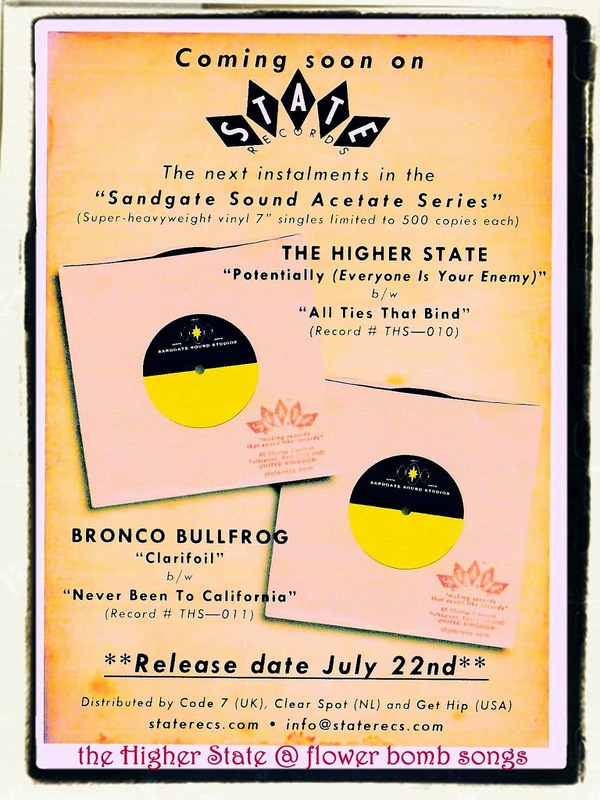 Prior to the release of this album in November 2013 The Higher State released a single on their own label State Records as part of their "Sandgate Sound Acetate Series" This came out in July 2013, limited to just 500 copies on super heavyweight vinyl. 'Potentially (Everyone Is Your Enemy)' was backed with the non album cut 'All Ties That Bind' written by Mole. This could easily have nestled on the album but the 60s purist creatures that they are could not have a thirteen song album. The classic 60s albums never had more than twelve songs. The Higher State released one more song in 2013 when they provided a cover of the classic 'Don't Run And Hide' for the Fruits de Mer, Hollies tribute "Re-Evolution." 13th Floor Elevators covers for a forthcoming Fruits de Mer 7" box set, "7 And 7 Is".